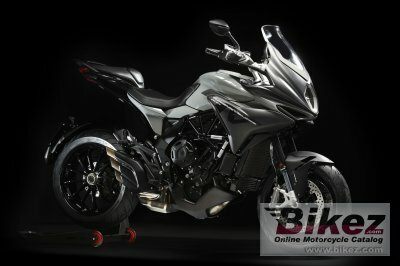 2018 MV Agusta Turismo Veloce 800. Picture credits - MV Agusta. Submit more pictures. This time we didn�t take our inspiration from our 75 world titles or our legendary riders to set new speed or power records. We did, however, accept a challenge that was perhaps even more difficult, at least for us who feel at home on the track and are often the first to see the chequered flag flying: to make an MV Agusta touring bike. Front brakes: Double disc. ABS. Bremo. Rear brakes: Single disc. ABS. Bremo. Ask questions Join the 18 MV Agusta Turismo Veloce 800 discussion group or the general MV Agusta discussion group. Get a list of related motorbikes before you buy this MV Agusta. Inspect technical data. Look at photos. Read the riders' comments at the bike's discussion group. And check out the bike's reliability, repair costs, etc. Show any 2018 MV Agusta Turismo Veloce 800 for sale on our Bikez.biz Motorcycle Classifieds. You can also sign up for e-mail notification when such bikes are advertised in the future. And advertise your old MC for sale. Our efficient ads are free. You are also welcome to read and submit motorcycle reviews.